Manage, Create & Maintain Recurring Jobs, Urgent Jobs, Invoices & More with Our Asset Management System. For a 14-Day Free Trial, click here! A Full Featured Job Sheet and Asset Management Software Designed to Manage and Streamline Your Entire Business from Start to End. Keep Your Company and Customer Assets Organised! With Eworks Asset Management Software you can manage, create and maintain recurring jobs, urgent jobs, invoices against assets, recurring invoices and maintenance services. 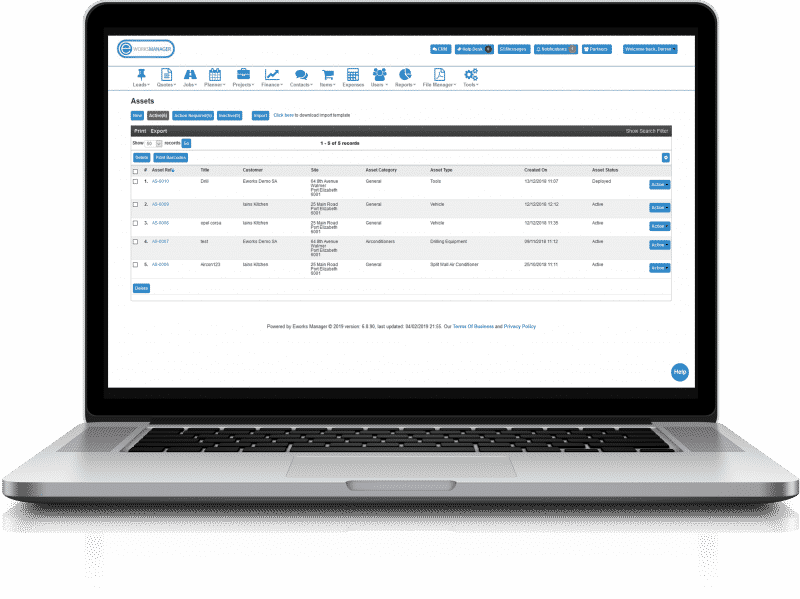 Easily keep track of your internal assets whether that be your office equipment or vehicles and your customer assets which could be boilers, or any other equipment provided to a customer that might require a yearly service. Eworks Managers Asset Management feature is unique from others on the market because it integrates into our job management system! With a few clicks of a button you can view all your assets, jobs, services, and asset components all in one system. This improves workflow and makes life a lot easier. Ditch the books and book a demo today with a member of our team and see how our Asset Management Software can help your business. 1What is Asset Management Software? An asset management system is built around managing and keeping a track of pieces of equipment and machinery. A system where you can capture specific details around these assets will make sure the small details are not missed. It will also allow you to schedule or create jobs around these assets so that reactive maintenance is carried out on time. Keeping track of the location of the asset, especially when assets are moved around. With an asset monitoring system, you can update the location of the asset as and when it is moved – therefore, an asset is never lost. Having all asset information logged in an all in one system means that nothing is left up to chance. It means that with a click of a button, where ever you are in the world, you have access to vital information. Being able to safely store and categories your assets increases productivity as your staff won’t have to go in search of information when creating a job for an asset. By using a system to track assets on your site or on your customer's site, will ensure those unexcepted costs and legal implications are reduced if anything is ever questioned. Custom fields can be added and updated against an asset each time a job is done against an asset. Whether your operative needs to record a temperature, input a date range or select from a list or dropdown. This means that every time an asset is worked on and those custom fields updated from the mobile App, the information is saved and stored.